In his comments on the sixth commandment, “You shall not murder,” John Calvin writes, “The purport of this commandment is that since the Lord has bound the whole human race by a kind of unity, the safety of all ought to be considered as entrusted to each.” As creatures made in God’s image, we are called to do whatever is required to “defend the life of our neighbor; to promote whatever tends to his tranquility, to be vigilant in warding off harm, and, when danger comes, to assist in removing it” (Institutes of the Christian Religion, 2.8.39). Calvin’s explanation highlights what the Christian tradition has often referred to as the commitment of “solidarity.” The sixth commandment, according to Christian teaching, does not merely prohibit outright violence. It calls us to do everything in our power to protect and preserve human life. Calvin puts it quite strongly: “if you do not according to your means and opportunity study to defend his safety, by that inhumanity you violate the law” (2.8.40). Note Calvin’s use of the word study. This is not simply a casual obligation. Unless we study and work, as individuals and collectively, to do all that we can to ensure the safety of our neighbors, we are guilty of inhumanity. The Heidelberg Catechism teaches the same interpretation of the sixth commandment in Lord’s Day 40. The prohibition of murder not only means that I am not to “belittle, insult, hate, or kill my neighbor – not by my thoughts, my words, my look or gesture, and certainly not by actual deeds.” It also requires that I love my neighbor as myself, being “patient, peace-loving, gentle, merciful, and friendly to him,” and that I “protect him from harm as much as [I] can.” I am neither to harm or “recklessly endanger” a person made in the image of God. In short, the catechism calls us not merely to be reactive against threats to the sanctity of life. We must be proactive in fostering the conditions necessary for life. We do this only when we stand in solidarity with one another in love, mercy, and friendship. The Heidelberg Catechism makes it quite clear that these obligations do not merely fall upon human beings as individuals. On the contrary, government is armed with the sword for this very purpose: “Prevention of murder.” It is striking that the catechism does not merely say – as some Christians have said – that government is given the sword to punish those guilty of murder. It calls the government to use its power to prevent murder from happening in the first place. Government, too, is called to be proactive, not merely reactive. Indeed, protecting and promoting the sanctity of human life is the primary reason why we have coercive government at all. Catholic theologians have described Christian teaching as protecting the sanctity of life as a “seamless garment” from conception to the grave. Protestant ethicists have emphasized the need for Christians to hold to a “consistent ethic of life.” This has several important implications. In his classic short story “Jesus Christ in Texas” (1920) W.E.B. DuBois explored what it might have looked like if Jesus had reappeared incarnate in the early twentieth century South. In the story a stranger, who a white pastor senses he has known long ago but can’t determine just where or when, secretly exchanges places and clothing with a black convict on the run from police. Falsely charged with attacking a white woman, the stranger is viciously lynched by a white mob. She shuddered as she heard the creaking of the limb where the body hung… she saw the dead man writhe. He stretched his arms out like a cross, looking upward. She gasped and clung to the window sill. Behind the swaying body, and down where the little, half-ruined cabin lay, a single flame flashed up amid the far-off shout and cry of the mob. A fierce joy sobbed up through the terror in her soul and then sank abashed as she watched the flame rise. Suddenly whirling into one great crimson column it shot to the top of the sky and threw great arms athwart the gloom until above the world and behind the roped and swaying form below hung quivering and burning a great crimson cross. She knew, and the very horror of it lifted her dull and shrinking eyelids. There, heaven-tall, earth-wide, hung the stranger on the crimson cross, riven and blood-stained, with thorn-crowned head and pierced hands. She stretched her arms and shrieked. DuBois’s story is fiction, of course, albeit fiction that speaks a powerful truth. 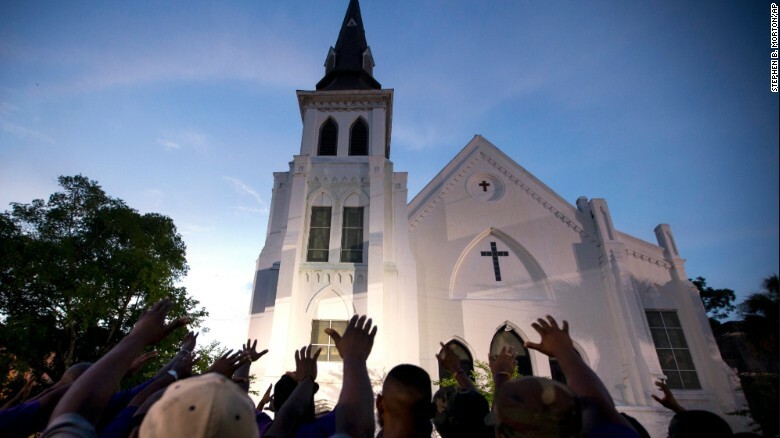 But in the events of this past week, beginning with the horrifying tragedy at the Emanuel African Methodist Episcopal Church in Charleston, South Carolina, this story was played out in the truest way possible. A deeply disturbed young man, filled with self-righteousness and hate, was determined to do what he could to spawn violence in return for perceived injustice. He was welcomed with open arms by Christians meeting for prayer. He was given the special seat just next to the pastor. Near the end of the time of prayer he opened fire, murdering nine of the black worshipers in cold blood, and then turning his gun on himself. Only because his suicide attempt failed did he flee, to be captured later by police. Those nine Christian women and men had taken up Christ’s story as their own, paying the ultimate price because they were willing to welcome a stranger. Like Jesus, they were betrayed by an enemy they had treated as a friend. Immediately the national media and the politicians took up the appropriate battle cries, exploring the significance of the shooting for matters of race, gun control, or South Carolina’s Confederate flag. The public, liberals and conservatives alike, joined in the free for all on Facebook, Twitter, and other public fora. Evangelical leaders called for justice. Some conservatives went so far as to bemoan the fact that the worshipers at Emanuel were not permitted to have and use guns to defend themselves. This is a completely understandable reaction. Jesus’ disciples also wanted to use the sword to defend their Lord when he was confronted by his enemies during that prayer meeting in Gethsemane. It is sobering that Jesus’ final act of healing before his death was in just this instance, on behalf of one of his enemies, a member of the armed mob who had been wounded due to Peter’s act of self-defense. I just want everyone to know, to you, I forgive you. You took something very precious away from me. I will never talk to her ever again. I will never be able to hold her again. But I forgive you. And have mercy on your soul. You’ve hurt me. You’ve hurt a lot of people But God forgive you, and I forgive you. You know I forgive you and my family forgive you. But we would like you to take this opportunity to repent. Repent, confess, give your life to the one who matters the most, Christ, so that he can change it, can change your ways no matter what happened to you. And You’ll be OK.
We welcomed you Wednesday night at our Bible Study with open arms. You have killed some of the most prettyfullest people that I know. Every fiber in my body hurts, and I will never be the same… But as we say in Bible study, we enjoyed you. But may God have mercy on you. How many of us would be capable of taking up Christ’s story in these ways? How many of us could offer such testimony and forgiveness? These brave Christian men and women of Charleston are enacting Jesus’ life and death in the most breathtaking way. Pray for them. Learn from them. This is the Gospel in action. This is Christian ethics in its purest form. American Guns, Reason, and a Fat Walrus: Which One Did the Media Get Right? I think many of you know that in America, our Constitution guarantees our individual right to bear arms. And as president, I swore an oath to uphold that right, and I always will. But at the same time, as I’ve said in the United States, I will continue to do everything in my power to pass common-sense reforms that keep guns out of the hands of criminals and dangerous people. So the president didn’t exactly “blame” Mexican violence on American guns, let alone on the United States. He simply stated some troubling facts about the rampant violence in Mexico that helps to destabilize the country, and its link to trade in American guns. The president would be wrong not to acknowledge such facts, or to fail to recognize the problem as one for which America should take some measure of responsibility. We would expect the same if terrorists were killing Americans with weapons brought from, say, Iran. Now let’s get it out there right away. It is ridiculously foolish for conservative Christian leaders to be critical of a Day of Reason. I understand the background of the day, and the intent of humanist organizations to use it to criticize the National Day of Prayer as an establishment of religion. But the appropriate Christian response, one would think, would be to praise the day by saying that Christians embrace both faith and reason (we do, don’t we?) and the contributions they have made to this country (we do admit that, right?). Criticizing reason while defending faith is sort of like loading a gun and giving it to a man who has just broken into your home to assassinate you. What was Nance thinking? That said, Slate’s headline is highly misleading. Nance did not blame reason for the Holocaust. She made a historical reference to a specific historical and philosophical period in western civilization known as the Age of Enlightenment, or the Age of Reason, and noted that one of its products was a godless moral relativism. She then drew a line between that godless relativism and the Holocaust. She could have drawn other lines to the great Communist atrocities of the century. Most prominent historians, and many ethicists, draw the same connections. Slate writer Amanda Marcotte might want to start with a standard Holocaust history like The Holocaust, by Robert Dwork and Robert Jan Van Pelt. It’s media reporting like this that seriously distorts civil discourse in America. Reporters on the right and the left and in the middle need to start focusing on what’s actually happening and what people are actually arguing rather than on what sounds controversial or sensational. The media did get one story right, however. On Thursday Montreal Canadiens’ forward Brandon Prust called Ottawa Senators’ head coach Paul MacLean a “bug-eyed fat walrus.” MacLean had just blamed the Canadiens for causing their own player’s injury in the previous night’s game, when a Canadiens defenceman had passed the puck to teammate Lars Eller with his head down in a dangerous area, only to see Eller get crushed by the Senators’ Raphael Diaz. Prust was responding to MacLean. Comments Off on American Guns, Reason, and a Fat Walrus: Which One Did the Media Get Right? What is the Christian position on gun control? I receive regular emails from a number of Christian organizations and denominations advocating that I take particular political actions or support specific policies. Last week I was inundated with messages regarding gun control, nearly all of which sought to persuade me that my Christian faith requires me to support a particular policy or political stance. … if people of faith respond differently just because they are people of faith — that our faith overcomes our politics here, and that gun owners and gun advocates who are people of faith will act in this situation as people of faith, distinctively and differently. Not a word on the constitution in this appeal, nor the faintest recognition that inscribed in the American Bill of Rights is the right to bear arms for the purpose – not of hunting, or of serving in government – but of securing the rights of a free people. Faith must not simply overcome our politics, apparently. It must also overcome our constitutional obligations to one another. The United Methodist Church’s General Board of Church and Society likewise calls me to yield to the “moral imperative” of stronger gun control laws, noting that 47 religious leaders have signed a document declaring their support for legislation that would 1) require a criminal background check on anyone purchasing a gun, 2) prohibit civilians from purchasing “high-capacity weapons and ammunition magazines”, and 3) make gun trafficking a federal crime. This statement, thankfully, addressed the question of the constitution, though only to state that the signers believe that the steps for which they are calling are compatible with the right to bear arms. Fair enough, though more on this would be helpful. But aside from appealing to safety and common sense, the Methodist Church gives me no biblical or theological reason why I should support this policy, nor does the letter signed by the 47 religious leaders do so. Yet Land says that Southern Baptists “believe our nation can and should take some preemptive actions to quell gun violence in ways that do not infringe on the Second Amendment.” Among these actions Land identifies numbers 1 and 3 from the letter signed by the 47 leaders, but he notably leaves out the proposed prohibition of high-capacity weapons and ammunition magazines. Land also calls President Obama to respect local authorities and states rights, asks him to consider taking action to constrain graphic violence in video games and other entertainment and urges consideration of stricter measures to contain potential violence on the part of the mentally unhealthy. Yet like the statement of the 47 leaders, Land gives little theological reason for his positions. So what is the “Christian” position here? Wallis offers the deepest theological analysis of the appropriate Christian response to the problem of gun violence, but he is most dismissive of constitutional concerns. Land is most sensitive to constitutional constraints, but it’s hard to see how his position is distinctively Christian. There does seem to be a consensus among all three groups that there need to be criminal background checks on gun-purchasers and that gun trafficking needs to be a crime. But what if our “faith” demands more than the constitution allows, as Wallis’s rhetoric might suggest? On the other hand, what if our faith requires us to submit to a constitution that prevents us from legislating policies we might otherwise have good reason to support? At the same time, what if the positions of the United Methodist and Southern Baptist churches owe more to their political convictions (and respective constitutional interpretations) than to any sort of substantive Christian teaching. What if there is no “Christian” position on gun control? Unfortunately, the inevitable result of all of this ecclesiastical advocacy is a loss of credibility on the part of the churches. We all know that Wallis and the United Methodist Church’s General Board of Church and Society lean left, and that Richard Land and the Southern Baptist Convention lean right. We know their respective attitudes toward gun control. And so we take their statements on these matters worth a grain of salt. Nothing has changed except that we all ignore the churches just a little bit more. In a sense Wallis does hold more credibility because he does not speak for a church. And we do want Christians to reflect on the potential insights of their theology for difficult political problems. Removing religion from political arguments may seem ideal, but in reality it simply obscures the reasons why people support the positions they do, impoverishing public debate. But Wallis’s enormous confidence in the degree to which his own political judgments are the demands of the faith is unwarranted. Unless you already agree with him, he’s probably not going to convince you. It’s time for American churches (and theologians) to reconsider their claims to authority on matters of politics and policy. The church is charged with the proclamation of the gospel and the whole counsel of God to a suffering and sinful world. The more we waste our “ecclesiastical capital” advocating policies that have little obvious relation with that mission, the more we undermine our own cause. Comments Off on What is the Christian position on gun control?